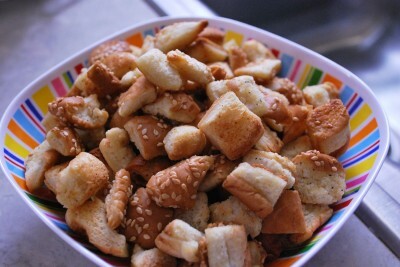 Today, we’re talking croutons! 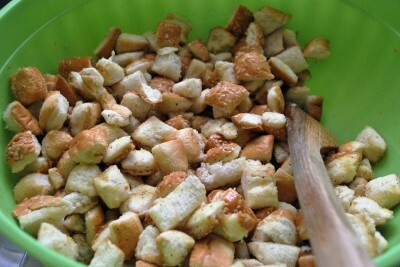 I love making my own croutons. They’re so delicious! I eat so many of them, I forget it’s salad that is supposed to be the main attraction. Last night I had salad and I kept going back to add more of these croutons. When I have bread that is starting to get hard or stale, then I know it’s time to make some of these babies. Here is what you need for these croutons. 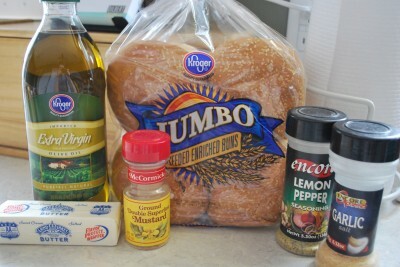 Bread, butter, olive oil, ground mustard, garlic salt, and lemon pepper seasoning. That’s it. Simplicity is bliss! Speaking of olive oil, doesn’t that make this a healthy recipe? My vote is yes! As for the spices, these are just what I used this time. You can change it up if you like. Use whatever spices you have on hand or ones that float your boat. Italian seasoning, cumin, chili powder, or onion powder would be great options! My favorite combination is sea salt and fresh ground pepper. If you don’t have a fresh pepper grinder, go buy one today. Thank you. The original recipe that I use calls for eight ounces of bread. I used 16 ounces, so I doubled this recipe. Math, again! I amaze myself! You can use eight ounces or more and just adjust your recipe accordingly. (I will post the recipe at the end.) You can use whatever kind of bread you have. The recipe says French bread, but I’ve used loaf bread, hot dog buns, sub buns, and hamburger buns. Change it up! First you want to cube your bread and place in a large bowl. 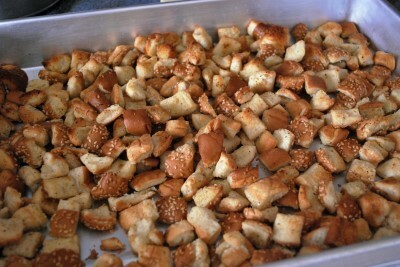 If you want big croutons then cut your bread into large cubes. If you like small ones, then cut them small. I like variety, so I cut large and small. I live on the edge. After you cube your bread, melt your butter in the microwave. Mix in your olive oil and spices. Pour your olive oil mixture over your cubes and toss gently to coat them evenly. Don’t stir too hard and mash your bread – the bag boy at the grocery store doesn’t like competition. Pour the cubes into an ungreased pan. You could use a cookie sheet, but I used a cake pan. I’m not exactly known for my gracefulness when stirring. I knew they’d end up all over the floor and Dottie had already eaten Annie’s crackers from lunch. Stick the pan into a 400 degree oven. 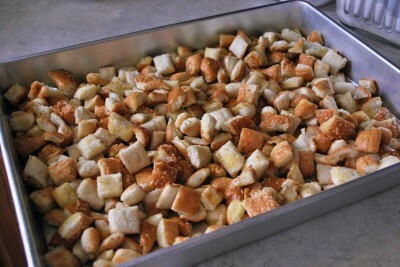 You want to stir your croutons every five minutes so they are evenly cooked. You’ll bake a total of 15-20 minutes, depending on how crispy you want them. I like mine a little chewy, so I don’t bake them more than 20 minutes. You can gauge how they’re doing each time you stir. This is after 15 minutes. They’re almost done as you can see, but not good enough for me so I stuck them back in for five more minutes. I almost ate one, but practiced discipline. Here they are just right! Yummy! 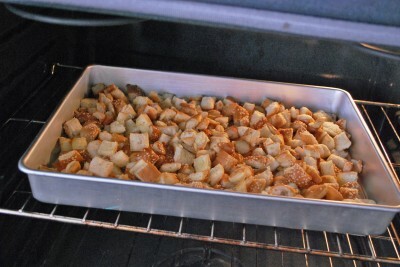 My whole house smells like a crouton bakery. When they’re totally cooled, you can store them in an airtight container or a Ziploc bag. They’ll keep for a long time. But really you won’t have to worry about it because you’ll eat them all the same day, right? Right? Not that I did that or anything. 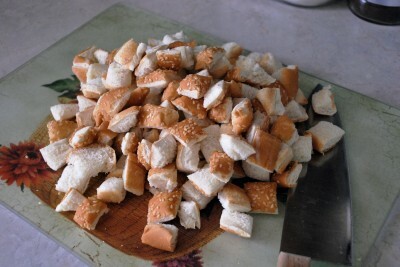 Place bread in a large bowl. Combine the remaining ingredients; drizzle over bread and toss to coat. Place in a single layer in an ungreased 15-in. x 10-in. x 1-in. baking pan. Bake at 400° for 15-20 minutes or until golden brown, stirring occasionally. It’s only been a year and a half since you posted this recipe..but just now found it lol. I am so glad you posted this. Every week I make my own bread. Most weeks this turns out awesome..but some loaves by the end of the week start crumbling and it makes it hard to make sandwiches out of. 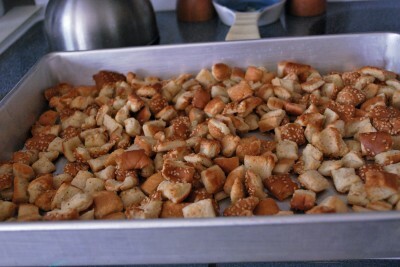 Well rather than feed my chickens the remainder of the loaf, now I can make croutons! The kids will eat these for sure for snacks. I need as many snacks as I can get right now! Who knew boys could eat so much! Where do they put it!?? Those look so so yummy!!! I have had Stacy’s croutons and I eat them like my husband eats M&M’s, by the hand-full. They are WONDERFUL! Thanks for posting this on the site, it’s going to come in very handy when I make my first attempt at making them.